No pre-wedding photo shoot is complete without some cute pictures of you the bride and your bridesmaids getting ready for the big day. This dreamy lace design bridesmaid robe in dusty rose color makes every photo look so fun and glamorous. The DAISY Lace Satin robe is beautifully crafted from deliciously soft Satin fabric which truly is a dream to wear. The luxurious robe is even more glamorous with elegant daisy lace trims which sets the romantic tone that you love. It’s a must-have for the bridesmaids and perfect cover-up in the morning, in the evening, or any time between! 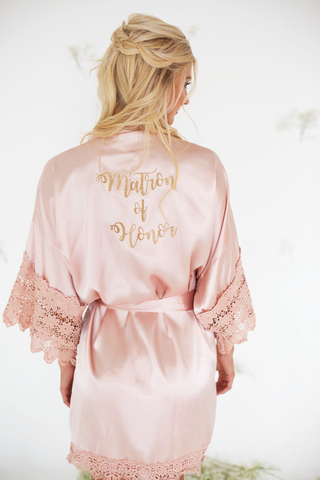 Turn this Lace Satin robe into the best bridesmaid robes by adding a touch of customization such as glitter initial, monogram, or message to the front and back! Made from softest Satin with elegant daisy lace trims.